N o sooner had the French and Indian War ended before the road to the American Revolution began. In an effort to prevent further conflict between the colonists and the Indians, Britain's Chancellor of the Exchequer, George Grenville, issued the Proclamation of 1763, which set a western boundary on American colonial expansion. The Americans, many of whom fought hard for the British empire, resented the control London was trying to exert from thousands of miles away. This growing hatred of the British Parliament became even more intense with the passage of the Stamp Act in 1765. Implemeneted to raise revenue for the the stationing of British redcoats on colonial soil, the colonists viewed the Stamp Act as an illegal tax on their internal commerce. Crying "NO TAXATION WITHOUT REPRESENTATION," angry mobs tar and feathered local tax collectors. The hatred of the Stamp Act led to one of the first united action in the colonies, the formation of the Stamp Act Congress. This concerted action translated into aan American-wide policy of the non-importaiton of British goods. Faced with the loss of the American market, British merchants pressed Parliament to repeal the Stamp Act, which it did in March 1776. Tesnions between Britain and the colonies quickly sparked again. In March 1770, a sharp but seemingly inconsequential exchange between a Bostonian and British redocat turned into the Boston massacre. British soldiers shot and killed five colonists. The situation was quickly resolved, however, as two colonists, John Adams and Josiah Quincy, defended the soldiers in a Massachusetts court, where they were found not guilty of murder. Their acquittal finally brought a sense of calm to the colonies. Alas, this calm did not last long. In 1773, the British government attempted to bail out the East India Company by dumping tea on the American market. 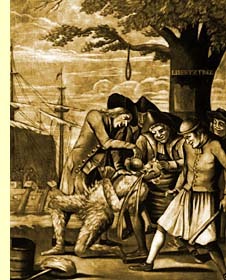 Outraged by the British government's attempt to protect foreign tea prices, a group of colonials dressed as Indians boarded the British ship holding the East India tea in Boston Harbor. In the cloak of darkeness, they dumped the tea into the water, making sure that it could not be sold in the colonies. The British responded to the Boston Tea Party by shutting down Boston Harbor. The colonies then began to form militias. The American Revolution was about to begin.